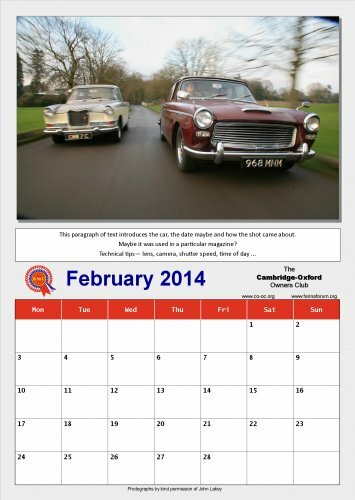 Our calendar theme this year is "Through Lakey's Lens" and features some of the favourite pictures from our Publicity Officer (and professional motoring journalist) John Lakey. Each picture has a story and John gives an insight into how the shot came about. The calendar is A3 sized and spiral bound for wall hanging. It also shows Club meeting dates and events. Professionally printed on quality paper. The price remains the same as last year: £14.99 for UK orders and £18.99 for overseas. You can pay by credit card, PayPal or Cheque. Orders must be received by November 18th to guarantee delivery for Christmas.